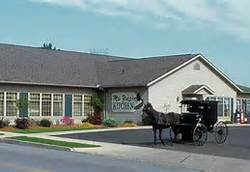 Located in the center of Ohio Amish country. Serving traditional Amish dish such as Wedding steak (seasoned ground beef, hand formed and lightly browned and then baked in a mushroom sauce). Broasted chicken (marinated hand breaded chicken and pressure fried) Many other entrees, sandwiches and homemade soups. Desserts are also a feature of the restaurant with homemade pies, date cake and old fashion cracker pudding. They also offer a buffet for breakfast, lunch and dinner several days a week They also offer salads and sandwiches for those not wanting a dinner. Debbie and I had the buffet and salad bare so we could try more dishes. The salad bar was a meal in itself. The buffet had BBQ pork, roast beef, turkey, Broasted chicken and sides. Great job!